The recipe has been added to your shopping list. Please log in to access all membership functions. You can try our meal plans completely free for 30 days. This dish is incredibly quick and easy to make - and the veg is chopped into big enough chunks that the kids can easily pick out the bits they're not big fans of. Enjoy! 1. Cook the rice following the directions on the packet. 2. Mix oyster sauce, fish sauce, soya and pressed garlic in a bowl. Add the beef strips and mix everything well - using your hands is easiest! Leave to sit on the kitchentop while you prep the rest of the ingredients. 3. Split the wash broccoli into florets. Remove the seeds from the washed bell pepper and roughly dice it. 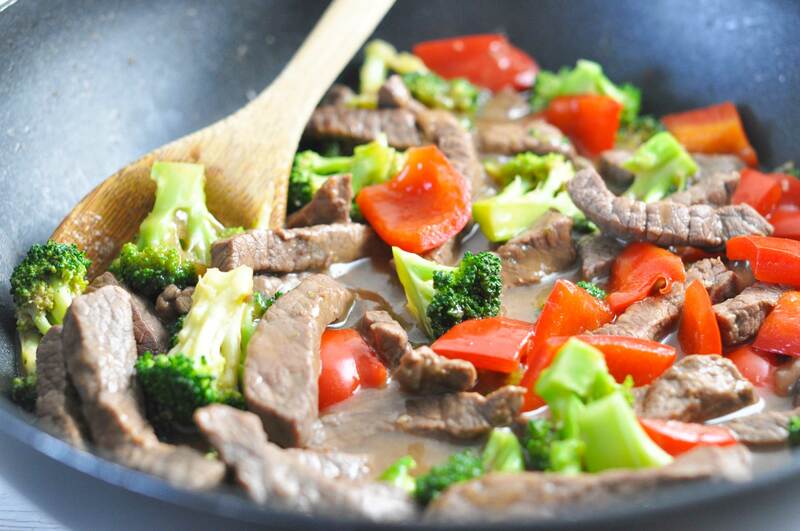 Heat up a deep pan or wok with a dash of oil. Flash fry the marinated beef for 3-5 minutes, until it has a nice sear. Add broccoli, peppers and water and let simmer for a few minutes, until the veggies are warm throughout but still have some bite left in them. Thicken the sauce with corn flour stirred into a bit of water. Season with a bit more soy and fish sauce if needed. Serve with rice.